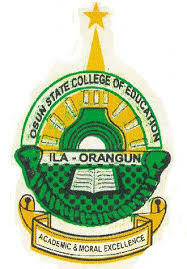 Osun College of Education Ila-Orangun [OSSCEILA] Pre-NCE [Full-Time], NCE [POST-UTME/Change of Institution], NCE Sandwich [Part-Time] Admission Forms, Courses, Admission Requirements and Application Guidelines for 2018/2019 Academic Session. Applications are invited from suitably qualified candidates for admission into the Osun State College of Education, Ila-Orangun (OSSCEILA) Pre-NCE, NCE and Degree programmes for the 2018/2019 academic session. Ensure to print your acknowlegment and await sms for your admission information on phone soon. NOTE: Application for NCE FULL-TIME[POST-UTME] is FREE, NO PAYMENT IS ATTACHED TO THE APPLICATION. Beware of Fraudsters.